Visions of Jesus Christ.com - Mary Ellen Lukas - Stigmatist. Above is from a 1996 newspaper article about Mary Ellen Lukas. Read/view full article [here]. July 18, 2013 Following excerpt from [this] story. For years, Mary Ellen Lukas has stayed under the radar so to speak, keeping a low media profile while traveling the US and other parts of the world speaking at churches and religious institutions under the guidance of her pastor, the Bishop of the Scranton Diocese, and her visions of Jesus Christ. 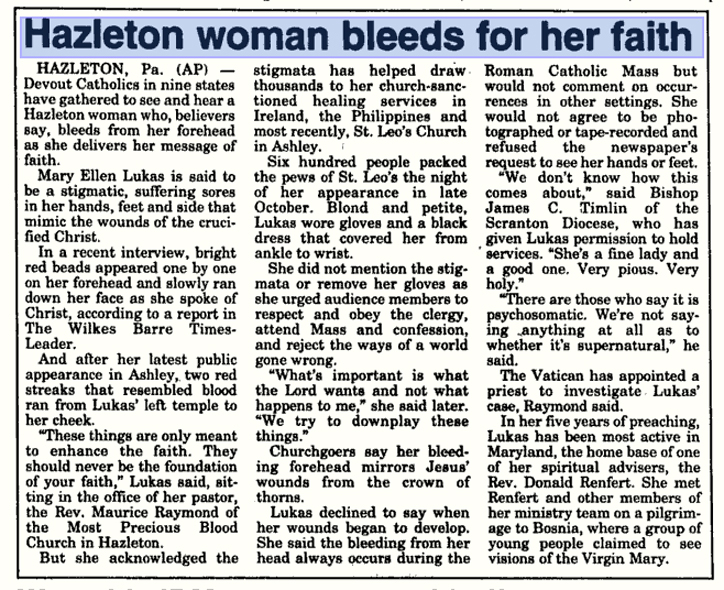 Not much is known about the life of the wife and mother from Hazelton, Pennsylvania, nor the mysterious stigmata that bleed on her forehead, palms, feet, and side during Mass, Good Fridays, and whenever she mentions the Eucharist. She permits no photographs and wears black fingerless gloves to conceal her wounds. Reportedly, thousands of believers flock to her public appearances. She is associated with the Catholic lay ministry, Our Father’s Divine Work.